This year I carved two pumpkins for Halloween. Like the last two years, I used the great stencils from Zombie Pumpkins. Halloween is fast approaching. 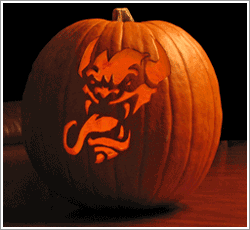 For the last couple of years, I've turned to the internet to help me with my pumpkin carvings. 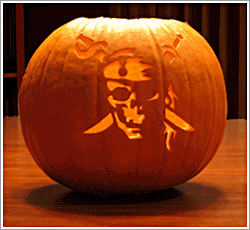 There are many free stencils or patterns available for download that make it relatively easy to create a memorable Jack-O-Lantern that will impress your neighbors and friends. This year my searching unearthed a pumpkin carver's goldmine: Zombie Pumpkins. This beautifully designed site contains over 100 high quality stencils grouped in several categories available for download. While they are not free, a small fee ($2 to $20–you decide) gives you access to the complete set. So if you're looking to carve a unique pumpkin this year, you won't want to miss this site. UPDATE: Last night I carved my pumpkin for Halloween. 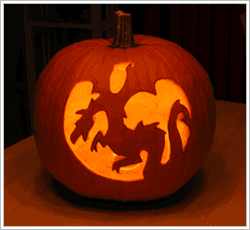 I chose the "Dragon Flight" stencil and it took me about three or four hours to clean out the pumpkin and complete the carving. But as you can see, it turned out quite excellent, don't you agree?